The revealing photo shows what appears to be hundreds of individual packages and skids of boxes haphazardly stacked in chaotic disarray on the dock of a large third-party freight carrier. There is visible damage to many of the boxes in the photo. Thankfully the photo is from a freight carrier we don’t use, but we still edited the photo to remove anything that might identify the guilty carrier (it’s a major brand and most people would likely recognize the logo). One important point illustrated by the photograph is that no matter how carefully we at Midwest Retail Services might pack an order for shipment to a customer, once the order is picked up by a freight carrier and leaves our dock (beginning the transit process) — its care and handling is out of our control (and yours). Orders on the Midwest Retail Services shipping dock awaiting pick-up by freight carriers. 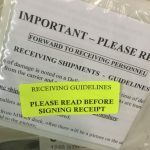 Something we stress to all of our customers in our Receiving Guidelines is that it is extremely important to inspect all deliveries to identify potential damages before signing and accepting any shipment of retail or pharmacy fixtures. If no damage or suspicion of damage is noted on a Delivery Receipt at the time of delivery, damage responsibility is removed from the carrier and any damage replacement costs are transferred to the customer. 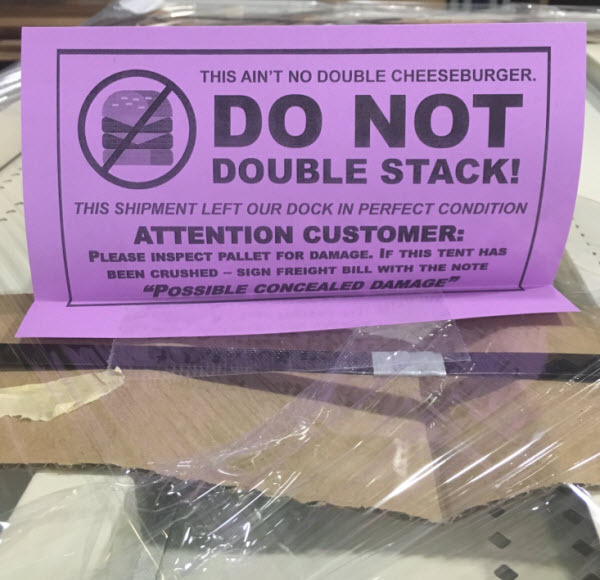 For any orders shipped on pallets from Midwest Retail Services, we include photos printed on the outside pallet label showing our customers the exact condition of the shipment when it was picked up by the freight carrier and left our facility. Midwest Retail uses “no stacking” tents to notify freight carriers not to stack fragile items and to provide a visual signal to our customers that damage may have occurred en route. Sign the delivery receipt in one of the three ways outlined below. If the you signed your Delivery Receipt as specified above, replacements will be shipped as soon as possible and usually at no additional replacement or freight expense. If no damage notation was made, but hidden damages are later discovered, these must be reported within 5 days of delivery. Due to the unique situations of individual shipments, cost of replacement or reimbursement is reviewed and decided upon on a case-by-case basis. While the claim is being reviewed, do not use the delivered items and move them as little as possible from where they were originally delivered. The shipment should be placed somewhere out of the way and all of the original packaging retained until the claim is resolved with the carrier. The carrier and/or inspection agency needs to be able to rule out packaging as a cause of the damage. Keeping the original packaging is necessary in order to determine if it was a contributing factor to the product damage, and failure to save the packaging could affect a settlement agreement. Midwest Retail Services and our manufacturing partners take exceptional care in packaging products for shipment. The vast majority of orders arrive at their destination with no damages; but if damage does occur, noting that damage (actual or possible) along with any other discrepancy at the time of arrival, is essential for the favorable settlement of a damage claim. Have more questions on this subject? Please send us your questions via our contact form or call customer service at 800-576-7577. This entry was posted in Ask The Team, Selecting Your Display Fixtures and tagged ask the team, Customer Experience, expert advice, Gondola Shelving, Problem-Solving, Retail Store Shelving, Tips I Can Use by Midwest Retail Services. Bookmark the permalink.